The synthesis of Marx and Foucault has traditionally been seen within the social sciences as deeply problematic. The author overturns this received wisdom by subjecting both thinkers to an original re-reading through the lens of the philosophy of critical realism. 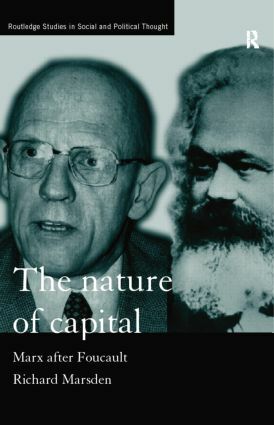 The result is an illuminating synthesis between Marx's social relations of production and Foucault's disciplinary power from which the author constructs a model of the material causes of our capacity to act. The laws of motion of a society and its microphysics are shown to be complementary parts of a theory of capital, society's genetic code. The Nature of Capital overturns traditional interpretations of Marx, presents an accessible and comprehensive account of the development of his model of capital and demonstrates its ability to explain modern societies.